This blog will offer some rare music for you to listen. 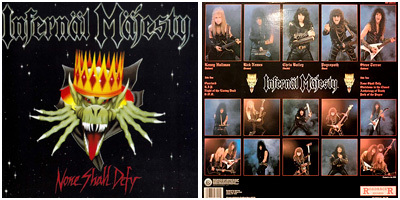 As a long-time music collector, I decided to transfer some great and rare (and out-of-print) rock and metal albums / demotapes to digital format to share it with you for free. You will also find a few albums which are available as reissues, but remixed or remastered beyond recognition, so enjoy the original versions here - as they were intended to be heard back in the days. Due to space and storage reason, all files will be published in lossy m4a or mp3 format with high quality settings. Please don't ask for lossless files !!! This blog was made to present some long-forgotten and essential musical gems of artists and bands who are inactive today or didn't re-release any of the items you will find on this blog. 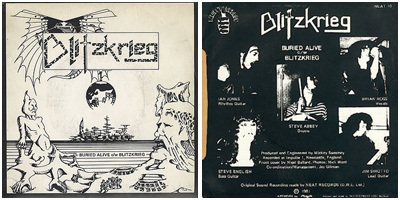 All digital transfers were made by BlackTrack74 (or at least cleaned and mastered from vinyl or cassette sources, offered by other fans and collectors), using high-quality turntables and expensive cartridges and tapedecks for best possible sound quality and, of course, professional studio software to remove unwanted noises like clicks, pops or tape hiss. If you are one of the original musicians or the copyright holder of any material published on my blog and you have any problem with the non-profit and 100% free publication here, feel free to contact me and I will remove your album / demo / single immediately. And now, Ladies and gentlemen, sit down and listen. 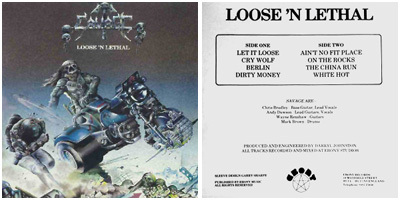 BlackTrack74 is proud to present a rare rehearsal recording from 1986, released on a limited edition vinyl 12" in 2008. 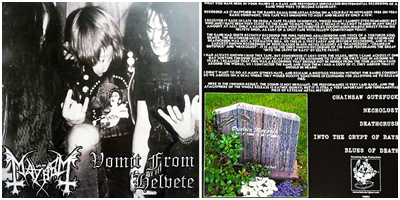 The notes on the backcover of the record say that it was part of the MAYHEM/VOMIT split cassette tape, spread by Euronymous back in the days. 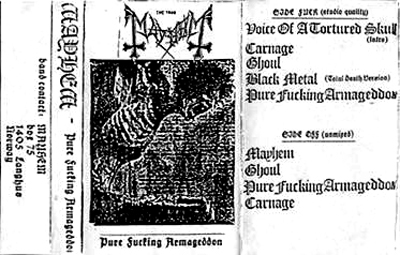 All tracks are instrumental versions and this recordings seems to be the only one with "Into The Crypts Of Rays", a CELTIC FROST classic played by early MAYHEM in a Total Death version !!! The version you can listen here was sourced from the 2008 vinyl. The original transfer sounded dull and lifeless, so BlackTrack74 decided to remaster the recordings to make everything a little bit more audible, compared to the original source. Enjoy !!! Finally I did it !! !I was thinking about that project for twenty years, because I suspected that there could be a better sourcetape available, but I am sure these recordings were never available in better quality.In the last twenty years, I compared different versions on various cassette tapes (high generation copies), but I came to the conclusion that the 1996 CD release was the best to work with...so I started restoring and remastering the stuff from that source.Please don't expect a good-sounding version !!! The original recordings are a mess...there are so many issues which are unable to fix, but I tried to do my best by using professional studio software and, of course, a pair of skilled ears. This version is more like a limitiation of all the defects on the original recording and my main intention was to reduce the hiss and other background noises to make everything a little bit more audible. Now you can hear the drums and guitars in a slightly clearer way, compared to the old CD and various tape copies which are available in trading circles. I also did some equalization and fixed some volume level issues here and there. As a special bonus, I added the so-called "Jam", included on early copies of the original demo. 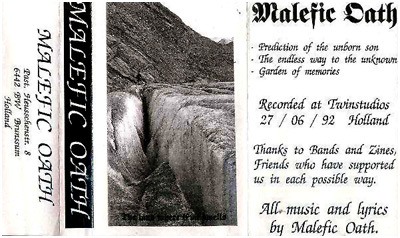 This bonus stuff was taken from a cassette and was never part of the 1996 CD release. 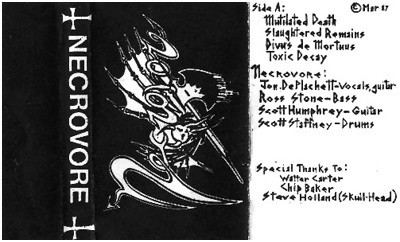 I am sure these recordings never sounded any better...and if you are into total necro sound, listen to this and enjoy !!! 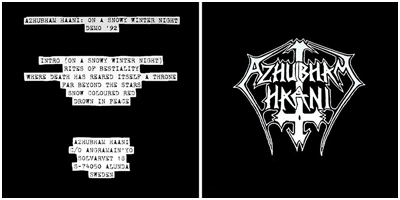 Now it's time for another goodie - a great atmospheric Black Metal demo from the glory days of Sweden !!! BlackTrack74 is proud to present a digital transfer from the limited 10" vinyl edition, released sometimes in the 00s. The quality of the original recording seems not to be the best and the version you can listen here sounds exactly like the original vinyl (minus clicks, pops and surface noise). Enjoy ! 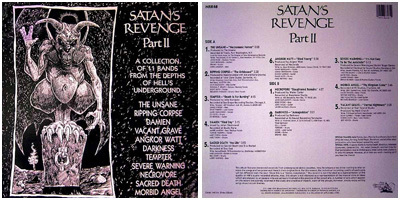 When the original Picture LP was released in the 90s, I was so impressed about the power, rawness and brutality of these recordings. I also had the "In Memorium" CD which includes an average transfer from the original vinyl, but I was never really satisfied with the sound quality. 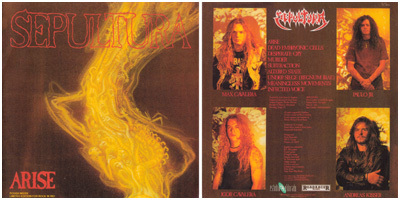 In 2009, the "Of Lord Satans Mysteries" CD / LP was released. Great layout, but sound was still not good enough I think. Whilst the original Picture LP has some volume level issues (sometimes the music gets very low when the vocals kick in), the 2009 edition was compressed too much, so all the deep frequencies from the bassdrum and bass guitar sound distorted. After all these years, I decided to do my own version. I ripped my Picture LP, cleaned it from clicks, crackle and hiss and used a multiband compressor to adjust the issues as good as possible. I also fixed some azimuth errors and gave the material a proper mastering. Now it sounds right (at least for my ears) and I never heard any better version of these recordings. Enjoy !!! Besides a cassette edition, this compilation album was never released on CD. 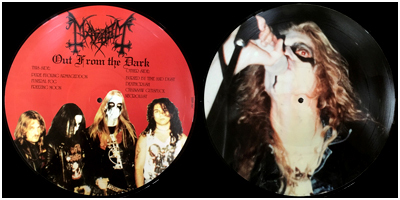 BlackTrack74 is proud to release a high quality transfer from a near mint vinyl copy. Enjoy !!! Sure, the sound on that release is not the best, but it was transferred from an original cassette and I suspect that it was recorded with a 4-tracker. Enjoy !!! Besides the fact that these rough mixes sound much more aggressive than the later official released version, some final overdubs are missing on that version here. Enjoy !!! 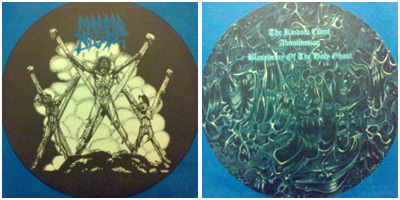 This transfer was made from a near mint copy of the Steamhammer original LP. Enjoy !!! The transfer you will find here was made from the original pressing. Enjoy !!! As I never had the chance to pick up an original demo for my collection, this rip was made from a cassette, owned by a good comrade. The audio was cleaned a bit and the lack of treble range was slightly fixed. Enjoy !!! This album is sold out since a very long time. 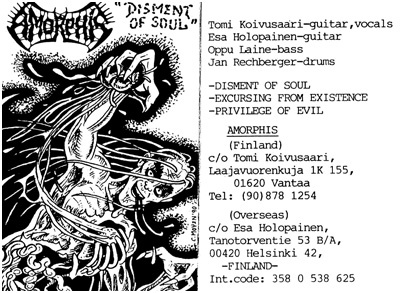 In the 90s, it was released on CD for the very first time, adding some demotracks as bonus. For the CD version, the albumtracks were definitely sourced from a vinyl source with average gear, so BlackTrack74 is proud to present a digital transfer from the original LP, made with better equipment. Enjoy !!! These four tunes are not the only songs which were recording during that sessions. 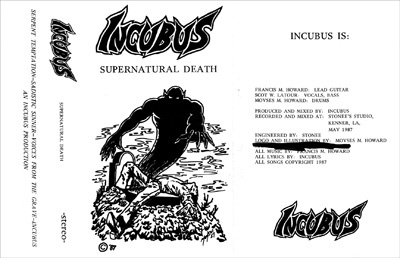 There exists a very rare 10-song version, including some unreleased songs and a full live show from 1987. Sadly I never came across one of these copies and instead re-posting bad versions which are available on the net on several other blogs, I decided to post the regular 4-song demo as a transfer from an original tape. Enjoy !!! The version you will find on the blog was transferred from the original demo. As the cassette lacks massive treble, it was reEQed and carefully denoised. Enjoy !!! This is metal history...!!! 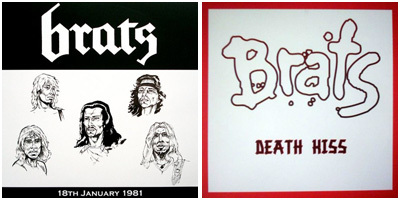 Brats were originally known as a danish punk band before King Diamond joined the band to change their direction to a more dark sounding quintett. The tunes you can hear now were recorded during a rehearsal in January 1981 and were never officially released in their entirety. 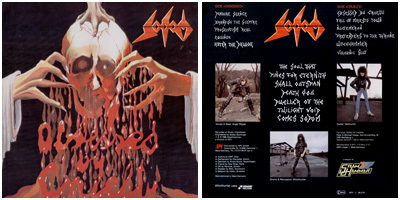 Only four songs were spread as a promotape, all others became famous and well-known in tape trading circles. Due to time restrictions of the vinyl, the makers decided to change the track order slightly. According to some tape traders and collectors, the version I've created here should be the original one. This album is a masterpiece and it is very sad that they never managed to record and release a follow up in the glory 80s. 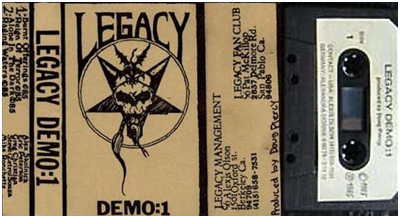 There are various demo and live tracks from 1988 which give an idea about the material for a possible second LP...but they needed 11 years to return with a new album and in the end it was not exactly what we expected...but still very good one.